Range bags may not be the most popular accessories among shooters out there. At first glance, they seem specifically designed for competition shooters. However, more and more casual shooters rely on these accessories for their obvious benefits. They are great for transportation and organization if you carry small things as well, not to mention home storage. What is the difference between a range bag and a classic bag? Well, the purpose! Sure, you can throw everything inside a random bag – hearing protection, goggles, scopes, ammunition and so on. But when you need something, rummaging up in a bag for small things can become extremely frustrating. This is why you need all those dividers and pockets – everything becomes more fun. You will find plenty of options on the market, but choosing the best range bag involves some research. Moreover, it pays off knowing the top rated products on the market. After all, there are some reasons wherefore they sell so well. At the same time, you will have to browse your personal needs before deciding what you need in a range bag – what works for some people will not work for everyone else. Choosing a range bag from a reputable manufacturer will bring in some peace of mind – you know that you opt for quality, good customer service, and a solid warranty. Some of the top names on the market include Bulldog, GunMate and Smith & Wesson, among others. Not only do they dominate the market, but their range is quite impressive. It makes no difference what expectations you have from a range bag – chances are you will find it with one of the top manufacturers out there. So, what are the best handgun range bags in commerce and what makes them so special? Spacious and well organized with multiple pockets for organization. Available in more colors and sizes. Standard size measures 18x13x10 inches and weighs four pounds. All pockets allow hands to go in with ease – no tiny pockets. Osage River’s best range bag is designed to last. 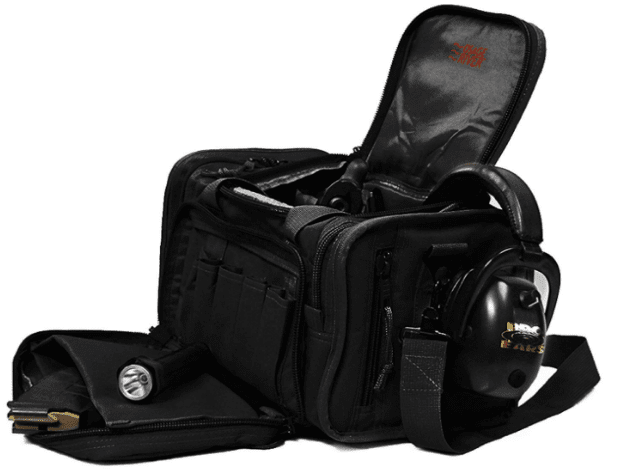 It is made to face heavy duty uses due to its 600D ballistic nylon construction. The zippers carry the same quality standards – heavy duty and durable. There are four different colors you can choose from – black, tan, gray and green. As for sizes, you only have the standard model and a smaller light duty version. No matter which option you choose, there will be plenty of space for more guns. The standard option is selling better because of its size. After all, your guns might get bigger as you gain experience, so think in the long run too. On the inside, you have two dividers. They are heavily padded to prevent accidental scratches or damage. They are also adjustable and even removable. You can take them off and chuck all the big parts in there, but you can also keep things neatly organized. At the end of the day, it depends on what size your guns are and how many of them you need on your day out – you can use one, two or three heavily protected compartments. When it comes to pockets, you have two large exterior pockets – they are zippered for safety. They are about the size of the bag, so you can also stick some magazines in there, lots of ammunition and accessories. Altogether – both on the inside and the outside, you have nine different compartments. Even the smallest pockets are still large enough for hands to comfortable get in. Carrying the bag is relatively simple too. You have a bolt handle for easy transportation, as well as a shoulder strap if you have to carry it over long distances. A removable pistol pouch is included in the package too. Features one massive compartment that can be converted into more smaller compartments. Only available in one color – black, as well as one size. The strong design and heavy features underline a great value for money. It measures 16x8x7 inches and weighs around two pounds. The inner compartment can be used for multiple items – guns, accessories, equipment, first aid stuff, and even safety equipment. Attaching dividers is fairly simple – Velcro style. They cannot really be moves, as the strips are located in specific areas. You can only adjust the number of compartments. The pistol rugs featured on the inside allow secure storage of your guns, as well as a good organization. Guns will not hit, bang or scratch each other due to the heavy padding on the rugs. The bag is designed to last. It has a sturdy construction and can take heavyweights. However, for maximum efficiency and more comfort, make sure you distribute the weight evenly. For all the features it comes with, the price offers great value for money. It is a simplistic bag designed for easy uses – there will be no guesswork involved. Zippers are sturdy and heavy duty. They are rugged and feel a bit more difficult than classic zippers, but they will last. You can also lock them – fit a padlock and no one will be able to access your gear without you knowing it. A shoulder strap was included for easy transportation. It features metallic attachments for strength and a shoulder pad for comfort. Everything else is built with the strongest available materials – from clips to zippers – for reliability. 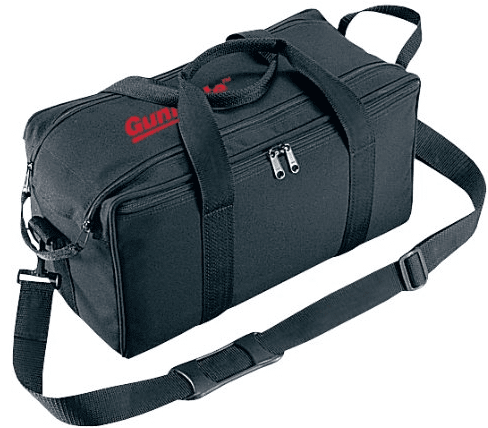 Given its size, Gunmate’s best range bag is considered a medium model. It can be small and compact, but it can also store large items if dividers are removed. It has a tough construction that can support heavy-duty uses. In terms of reliability, you can store up to four guns and impressive amounts of ammo. According to some tests, it can take up to 80 pounds of weight – make sure your back is good enough for this kind of weight though. Here at BagguBags we review for you all kinds of bags. We aim to make your life easy when you have to chose a bag for your every day needs. Our Reviews are Unbiased and Written by Experts in Bags Niche.